MMA fighter Evangelista "Cyborg" Santos lost his fight to Michael Page at Bellator 158 on Saturday night. Page finished Santos off with a crushing flying knee to Santos' forehead, immediately sending him to the ground as he writhed it pain. 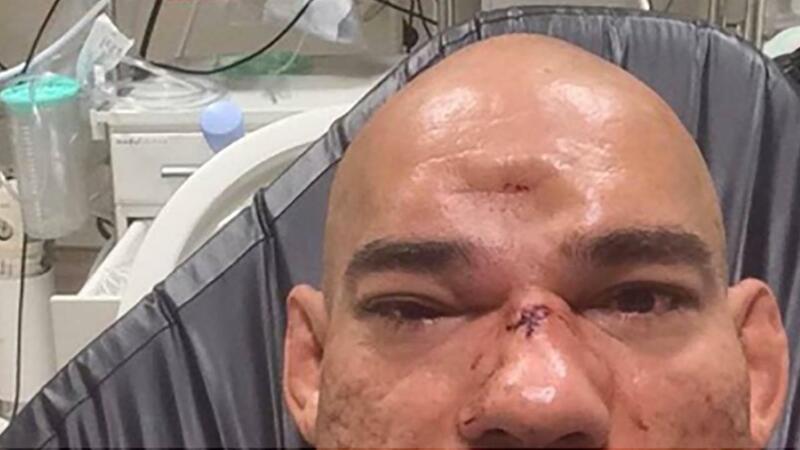 Later, Santos' ex-wife Cris "Cyborg" Justino posted an Instagram of Santos from the hospital showing the brutal aftermath of the hit. Santos' skull was quite literally indented where he took Page's knee. Santos later confirmed to MMA Fighting that he suffered a fractured skull in the incident. Justino wrote in her Instagram post that doctors said the injury could have been "life threatening" and that there is still a fear that his brain will keep swelling. Justino's post is below. WARNING: graphic content. ​​​​​As if the injury didn't look bad enough, someone in the know compared it to a car accident. MMA Fighting says Santos will undergo surgery in the United States and that while he will be sidelined for a long time, it doesn't mean his fighting career is over. Nonetheless, in an era when player safety is prioritized across nearly all sports, such an alarming injury may raise awareness to the dangers of mixed martial arts.